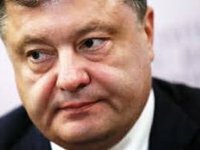 Mykhailo Kutsyn, who held the position of the Ukrainian Armed Forces General Staff Chief until July 3, was shell-shocked in the anti-terrorist operation zone in eastern Ukraine, Ukrainian President Petro Poroshenko said. While introducing candidates for law enforcement positions in parliament, Poroshenko thanked Kutsyn who "was shell-shocked in the anti-terrorism operation zone yesterday; he has a concussion and is staying at a hospital." The president appointed Viktor Muzhenko as the General Staff Chief on July 3.